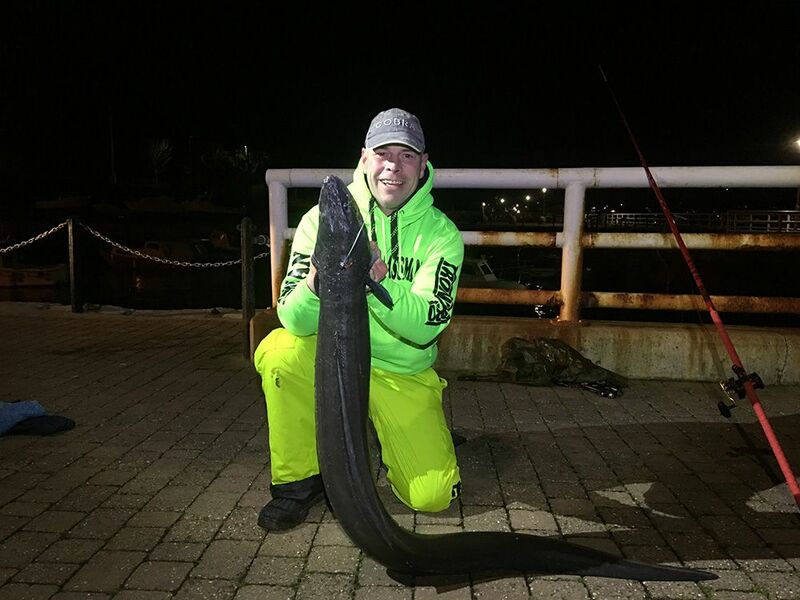 For a long time I’ve wanted to give conger fishing a go, in December 2017 I started my conger fishing career, leaning heavily on conger fishing legend Martin Larkin for advice and inspiration in my quest for big eels from the shore. In this blog, I look back on two sessions that made their mark on my winter congering campaign. This session took place in the middle of January fishing a mark on the River Tamar at Plymouth. The plan was to target a conger eel and possibly an elusive cod. The crew consisted of Brett Annetts, Martin Larkin, Adam Nicholls and myself. I hadn’t seen Adam for over 20 years when he was a junior angler! Brett and I arrived early in the dropping tide, despite this, enthusiasm got the better of us, and we just had to get a bait in the water! True to form, the action was non-existent. Martin and Adam, the more sensible of the crew, arrived a little later. With over eight rods, all baited up with a variety of different baits, we were hopeful. After fishing most of the dropping tide, we’d not had a sniff at range. I’d been fishing a whole, very fresh big mackerel bait and couldn’t believe there was no interest in it, with only thirty minutes to go before low water; things were looking pretty desperate. Plan B was needed! I rigged up with a big pound sized fresh cuttlefish. Lobbing this out, it was oozing ink. Bang on low tide, the drag started to click. I was straight on it, engaged the reel and leaning into the fish. The fight was brutal as always, but the Tronixpro Naga MX was doing its job well. It felt a decent fish, with some words of encouragement from Martin to go easy on the fish in mid-water. A few good dives for freedom were cushioned, I was fighting it patiently, using 40lb mainline and a 200lb trace gave me the confidence to bully it a little when required. The eel surfaced and looked a lot bigger in the water, the guestimate we gave it was around 25lbs, looking down from above. Brett was straight down the slippery steps to retrieve the beast, while I was a nervous wreck, not being able to see what was going on and waiting for Brett to do his thing. Brett missed the first shot, all I heard was Martin saying, “it’s off!”, my heart sank, but then, a few seconds later, the fish was grabbed and was being passed up to Martin who quickly gave it to Adam to unhook with the T-Bar. The fish was nowhere near as big as it looked in the water. When we weighed it, it came in at 16lbs. 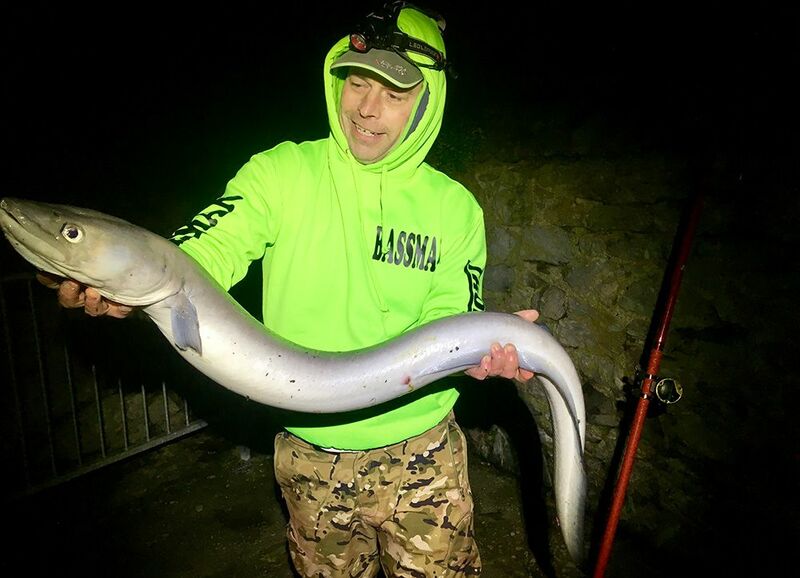 Not a big eel by Tamar standards, but it brightened up a desperately long session in howling winds. He was only thirty minutes out, as two and half hours in I had a tentative bite on the cuttlefish bait. The fish was barely swimming towards me, but I was getting very slowly slacklined. I carefully kept up with the fish, but a small tug and the fish dropped the bait. I put the rod down again. A minute later, the Naga MX registered more interest, a slight tap on the rod, followed by more slack line. The fish gave a gentle pull-down, I ignored it, more slack line and then a proper pull-down. I struck hard and hung on, trying to assess the weight of the fish. The Naga MX was locked over solid, nothing was happening, we were in stalemate. Next, the tip eased back, and some slight movement was detected. Five minutes later we were still in a tug of war. Eventually, I got her off the bottom and slowly moving up towards me. By now, I realised I was into a beast. Trying to keep the eel off balance. I was all alone and a bit out of my league, but, I hung on. Having absolute faith in your equipment helps at times like these. I was confident in the Naga MX and the 40lb mainline, I stuck at it. The fish broke into mid-water, and the rod bucked and down she went, taking line off the locked-up reel. I managed to turn her again, forcing her upwards. I was back in control. She was near the surface now, everything was aching, adrenaline was ripping through me, and I’d lost all track of time. She dived again, I just lent back and held on. She slowed, so I gave it everything and turned her upwards again. Another few tense pumps and she broke the surface with a violent head shake. It was at this point I was looking over the railings, and I could only see her head poking out, she kept trying to reverse, I couldn’t see the whole fish, then one big lift and she breached and left me speechless. She was big! The next challenge was to negotiate her the 30 yards around the corner to the harbour steps. It was now a stalemate, I couldn’t move her, at this point I remember shouting for help, but no support was around. I had to give her some more, she moved out of the tide and into the wall, my line scraping the sharp edges, my heart in my mouth. Everything stayed together though. She was too strong to hand line around the corner, so the rod took the brute force until eventually, I had her moving into the harbour area. All the time violent head shakes would test the durability of my rigs. Everything was set up at the top of the steps, and it took one last effort, everything I had left, to pull her into the steps. By this point, the fish was going nuts, hissing at me, spinning and doing everything in its power to break away. I kept the pressure on and steered the fish to the big step, she took another dive, but I managed to bring her back, she beached on the lower step, I took my chance. Dropping the rod and grabbing the trace line. I wrestled with her for 30 seconds before I managed to get some control and eventually wrestled her to safe ground, I collapsed, I was mentally and physically knackered! In complete shock, I phoned Martin, who then rang Anthony Edney and Matt Parry, who remarkably were just up the road. They go to me in minutes, soon followed by Martin. We nervously negotiated her into the big weigh sling. I was next to useless at this point, Anthony and Matt did most of the heavy lifting. The crew announced the weight of 30lbs 2oz, this on fully certified scales. Concerned for the fish, we quickly got the cameras rolling and filmed the release video. I was walking on air the day after. I only started conger fishing in December, and I couldn’t have done this without the help and guidance of Martin Larkin. He gave me a crash course in conger fishing. His advice and knowledge helped me set out on this solo mission, and I consider it a massive achievement for me to land such a fish on my own while being an adrenaline-fuelled quivering mess! We’ve gone through the emotional rollercoaster in my blog, and I haven’t mentioned my tackle as of yet, apart from the rod. I used the Tronixpro Naga MX for all of my conger fishing this winter. It is powerful to not only lob out big baits but to combat these strong fish in the snaggy environments they live. I run 40lb mainline straight through. I don’t bother with a leader. The trace is made from 200lb mono, it’s a running ledger, and I use a 20lb rotten bottom to eject the lead if its stuck. A single Tronixpro Big Dog II 10/0 is my go to hook. In my short experience using a pennel arrangement complicates matters and loses fish. I’ve had big eels pick up baits and turn it in their mouths, the second hook is obvious and leads to the fish spitting the bait or biting through the trace. I hope my blog has inspired you to set up your own trips to catch these fantastic fish. Providing you are kitted up with the right gear, you’ll have some immensely enjoyable fishing. These fish are big and powerful, and you have to be 100% confident in your equipment but also your ability to be able to handle something like this, especially when you’re on your own. I’ve learnt from the best and taken on as much advice as I could. I’d like to thank Matthew Perry, Anthony Edney and Martin Larkin for turning up so fast and sorting things out. I was a complete and utter mess! 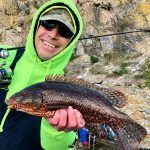 Paul “Bassman” Gordon is a Tronix Fishing Partner and runs a guiding service, Fishing Guides Devon.